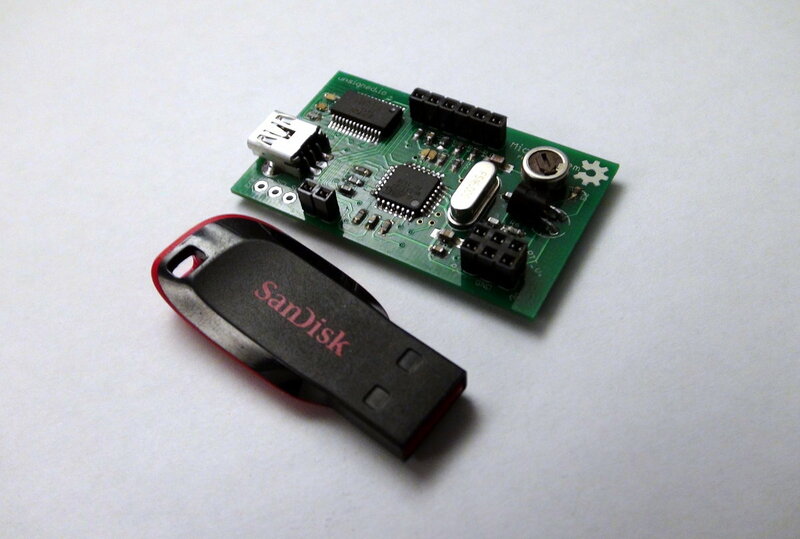 Here’s a photo of the MicroModem prototype compared to an USB thumb drive. The dimensions of the board are 29 x 49 mm, so it’s pretty compact! It’s actually only 66% of the total footprint of the Microduino-based version. 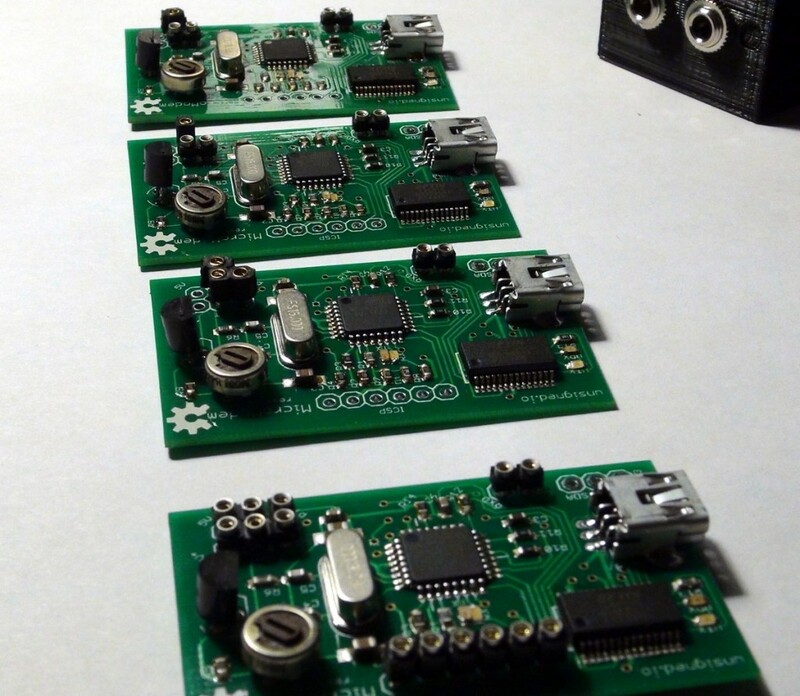 The new firmwares and Arduino libraries will of course be backward-compatible with the previous MicroModem versions! There will be a hardware detect feature in the library and firmwares that checks for hardware version and adjusts some configurations accordingly. Looks to be an interesting step forward from the current modem. Do you plan to break out other pins from the 328P for use as well – for example – to control say a Dorji DRA818V radio Module, and also a GPS – giving the possibility of a very small, all-in one APRS tracker ? I await with interest the release of this board! On the current board revision, there is a number of pins broken out. They are the UART, SPI and I2C interface pins (RX, TX, MOSI, MISO, SCLK and SDA, SCL), corresponding to Arduino pins D0, D1, D11, D12, D13 and A4, A5. The PTT trigger pin is also broken out directly on the radio connector, so you get both the MOSFET PTT trigger, and the “raw” logic pin, which corresponds to Arduino pin D3. HI, I am also interested in these cards. and as Bob says make it into a tracker would be really good. Looking forward to seeing when you release it and price..
Excellent…looking forward to seeing more. Can I use Micromodem for APRS Digi? And where are you from, because if is work for APRS Digi I want to buy , and can you shipping to Serbia? Do you have anywhere that I can look the Schematic of this board? Will you be documenting how to connect and use a GPS with this micromodem? I am new at this so trying to learn. I might make a tutorial at some point on how to connect a GPS, but right now I’m working on other things regarding to MicroAPRS. You should be able to figure it out though 🙂 Basically you just need to get the data from the GPS over the serial port and set the correct values via the LibAPRS library functions. There’s some examples in the library of how to do this. You can also ask in the forum if you get stuck!